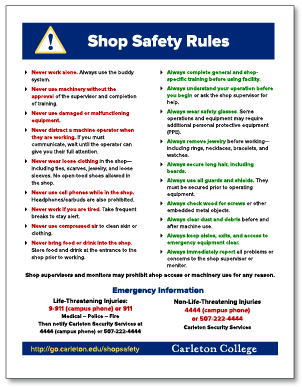 Here you will find everything you need to know about how to be safe using the Carleton shops and the equipment in them. Look around this site and you can find can find where the shops are, how to get access to the shops, the rules for keeping safe in the shops, and a complete inventory of our machine tools. There are general safety rules for conduct, clothing and personal protective equipment that will always be followed when working in Carleton student-access shops. These apply at all times. There are also further safety rules that apply to individual machines. See the individual machine pages and reminder cards for those rules. An overview of the training required to operate machines in the Carleton student-access shops. When using a Carleton shop, someone else must always be there. Depending on the equipment used, that person might be a Buddy, Monitor, and Supervisor.